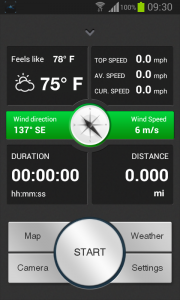 I usually keep track of my paddling data i.e., trip length, kayak speed, trip route, wind speed and temperature. Kayaklog collects that information for me as I paddle as well as any photos I take along the way*. I save my data, upload it onto their website where I access it, edit it and print it out if need be. 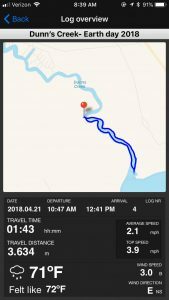 Recently I tested Kayaklog for the first time while paddling Payne’s Prairie and then again on Dunns Creek. I am impressed with the results. I used the free version, allowing me to create one free log, which I did as my test run. The app was easy to use. Just as we launched I turned Kayaklog on. The initial display shows the current weather conditions and offers recommendations for safety. A green bar indicating it is safe to go, a yellow bar when wind speeds are in the 5-8 Force range and a red bar when wind speeds are in the 9-12 Force range. The Force range number is based on the Beaufort Scale. Once launched, Kayaklog works in the background recording all the paddle data. If during a trip there is a need for a rest stop simply push the large circular ‘Pause’ button. The recording is on hold until the ‘resume’ button is pushed. There are options to get the local weather forecast up to 24 hours ahead by pushing the ‘Weather’ button. Another feature offered is the ability to take photographs right from the app using the ‘Camera’ button. Pictures taken are not only saved to the camera roll on the phone but also sent online and added to the rest of the paddle data. * I have not tested the Camera aspect of the app. At the conclusion of my paddle, I pushed the ‘Stop’ button with the option to name the trip and save it. There is also a ‘Delete’ button if I did not want to save it. Obviously I named my trip, pushed ‘Save’ and transferred my data online where I can view, edit and print my logs. 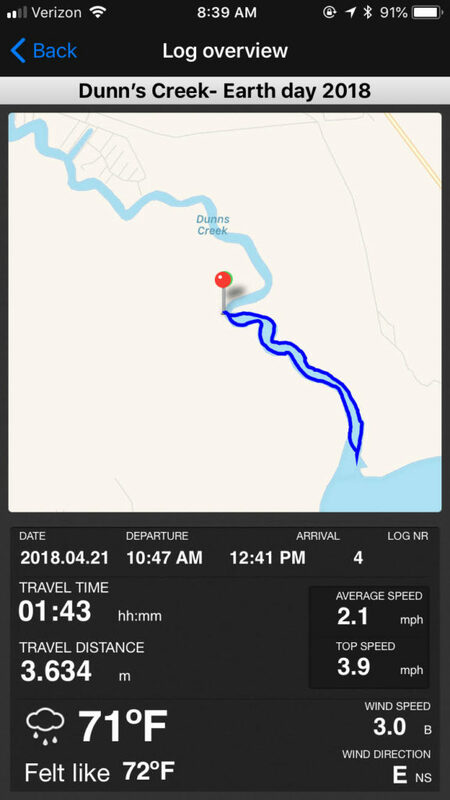 I like the app and will continue using it to record all my paddle data. Cost: Free and paid. Paid is $2.99 a month, paid monthly. I usually paddle around 4-5 times a month and feel this is a good price for what I get. I can cancel at any time. Since writing this review, Kayaklog began updating the app and in doing so actually broke the app. The final results after a paddle are incorrect and there is no longer the ability to view the app online. This app has crashed several times and has become quite buggy. 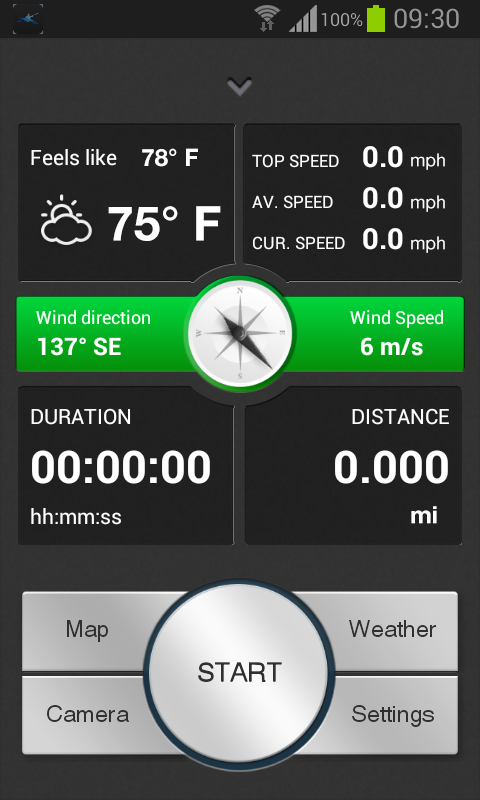 I am currently using and like Paddle Logger. Check out the Apple Store Preview page for more in depth information about the description and developer.